Total sausage-fest. Photo from Chris Beerman. The next time you’re gettin’ your suds on at the recently expanded ~CITY BEER STORE~ on Folsom, you’ll also be able to get your sausage on (I know, that sounds kind of wrong), thanks to ~CITIZEN’S BAND~. Chef Chris Beerman (it was fate that he’d be doing this partnership) is now serving a variety of sausages, like a housemade pork sausage with molasses and sage and a pork and bacon kielbasa, plus partnering up with local sausage-makers, like Peter Temkin at Showdogs, who will be providing an all-beef hot dog, while Ryan Farr at 4505 Meats will be making a sour berry ale cotechino with rosemary and black pepper. There will also be wild boar, smoked duck, and a bratwurst available. All the sausages will be served on grinder and torpedo rolls made by Cheryl Burr of neighboring Pinkie’s Bakery, and will come with whole grain mustard and cider vinegar-pickled onions. 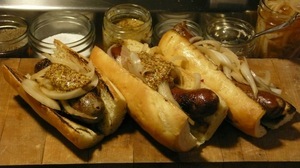 The cost will range from $5-$7, and the sausage service will run Tue-Sat 5pm-10pm. All you do is place your order with the folks at City Beer Store, and then you’ll need to swing by the bakery kitchen at Citizen’s Band/Pinkie’s Bakery (it’s just a few doors down) about 10-15 minutes later to pick up your order. You’ll be able to eat it at City Beer Store, just like the Toronado/Rosamunde style you have probably become accustomed to. Enjoy! City Beer Store, 1168 Folsom St. at 8th St., Suite 101, 415-503-1033. Citizen’s Band, 1198 Folsom St. at 8th St., 415-556-4901.